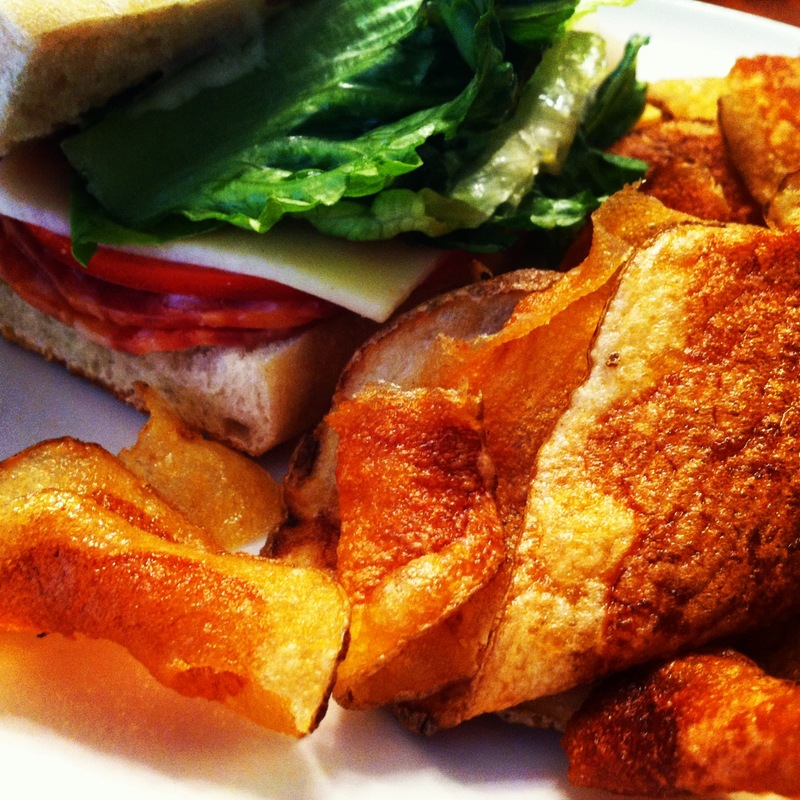 Today is Monday, meaning it is $5 lunch day at Amerigo Delicatus, near the corner of Larimer and Broadway. If you haven’t been in for lunch, $5 for an Amerigo lunch is a steal. Last week I had the sausage sandwich, featuring delicious house-made sausage served hot in a tomato sauce and topped with pecorino romano cheese, and it hit the spot. Served alongside it were house-made kettle chips that were AWESOME. I’m going back for the same thing today. The $5 Monday lunch menu is just one of several Good Deals offered by Amerigo, though. Tuesday night is Cheap Date Night; from 5pm until close you can get 3 antipastos, 2 entrees, 1 dessert, and 1 bottle of house wine for $50. Wednesday is Free Wine Night: each guest gets a free glass of wine with the purchase of an entree. Saturdays feature $10 bottomless mimosas and another $5 lunch. And Tuesday-Saturday is a happy hour from 3-6pm featuring 2-for-1 drinks and $1 bruschetta. While Amerigo definitely offers some Good Deals, Chef and Owner Ian Chisholm says his intimate Ballpark neighborhood restaurant’s bread and butter is its dinner. The affordable menu features a build-you-own anitpasto platter at $2/item, and a constantly rotating selection of four entrees, which on a given day might include items like a house-made canneloni with artichoke hearts and chicken; house-made gnocchi with brown butter, sage, pork tenderloin, fig, and marsala sauce; house-made linguini with the same delicious sausage as the lunch sandwich; and the melanzana (an eggplant parmesan). The taste to price ratio is spot on for all of the menu items at Amerigo, and the restaurant also features a small market from which you can take home assorted cheeses, pastas, sausages, sauces, prepared meats, and more. If you plan to go to Amerigo for dinner, be sure to reserve a table online as there are only 40 seats in the entire restaurant. And don’t skip out on the desserts, or you’d miss out on options like the bread pudding (which is made not from bread, but from house-made doughnuts). Fantastico! Amerigo Delicatus is located at 2449 Larimer St. and is open Mondays for lunch, Tuesdays-Saturdays for lunch and dinner, and is closed Sundays. Interested in living near Amergio Delicatus? Click here to search nearby homes for sale.